Book now the best chiropractors Encinitas CA has to offer. We believe in a mix of eastern and western medicine offering our clients holistic solutions that don’t just treat symptoms but put an end to many chronic conditions. We offer some of the best practitioners of acupuncture and chiropractic in Encinitas and Poway delivering time-tested methods that treat a wide range of diseases that are often misdiagnosed or completely overlooked by western medicine. 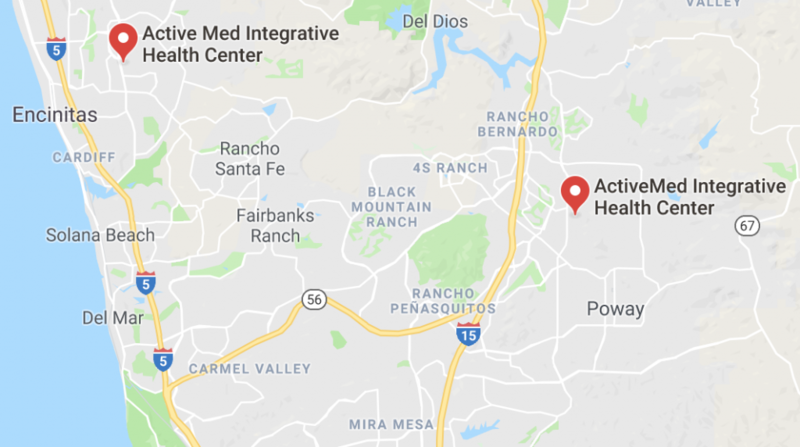 ActiveMed Integrative Health Center has a team of chiropractors in Encinitas, CA, dedicated to helping patients like you through treatments which reduce pain and ease a range of other problems. We also serve patients in Poway, Escondido, and other locations across the San Diego County in California. You may be familiar with our previous practice North County Health, providing top tier chiropractic service in Poway CA for over 10 years. If you want to be seen by best practitioners of acupuncture and chiropractic in Encinitas and Poway, book an appointment today! Chiropractic care is a safe, effective and natural approach to managing pain and other health related issues. Chiropractic care focuses on the diagnosis and treatment of neuromuscular disorders, with an emphasis on treatment through manual adjustment and/or manipulation of the spine. We have been treating patients for almost 20 years and have the best chiropractors in Encinitas. Our chiropractors seek to reverse disease, reduce pain and improve the functionality of patients while educating them on how they can account for their own health via exercise, ergonomics and other therapies to treat pain. Chiropractic treatment focuses on spinal adjustment. It involves applying manipulation to a vertebra that has abnormal movement patterns or does not function normally. In chiropractic treatment, the body is considered a living machine. When one joint is misaligned or damaged, it upsets the way the machine works, causing pressure on nerves, inflammation, and subsequent medical problems. Most chiropractic patients seek to restore mobility to their joints, which are restricted by tissue injury due to a traumatic event such as falling, repetitive stress, or sitting without proper back support. Often, this treatment uses hands-on spinal manipulation, but our Encinitas chiropractors use other techniques to manage a patient’s care. For instance, our chiropractors use natural agents like heat, water, massage, and exercise. WHAT CONDITIONS CAN CHIROPRACTIC TREAT? Yes, chiropractic treatment works. Its effectiveness in treating a range of disorders, ailments, and diseases has been proven in published studies. In 2004 an analysis published by Cochrane Collaboration found that chiropractic adjustments are beneficial for both short-term and long-term back pain. A group trial found that 22% of patients, who had chiropractic treatment, experienced fewer migraine attacks. In the same study, 49% of the participants said that the pain intensity was also significantly reduced. We offer the most experienced chiropractors in Encinitas, Poway, and Escondido. People love our services. Check out our Testimonials!